Join us December 15 for an out of this world experience in the Mayo planetarium. In an effort to raise money for GOFA, Mr. Larson is, once again, happy to share his time and knowledge to enlighten audience members about the wonders of the universe. So if you enjoy gazing at the stars and want to know more about what you see in the heavens, then this fundraiser is for you. On Saturday, December 15th, there will be two showings of From Earth to the Universe. The 3:00 show will run until about 4:30. Then the 6:30 show will last until 8pm. From Earth to the Universe is a full-dome movie that takes audiences through astronomers knowledge and understanding of the universe as well as a flying tour around the starry night sky, by Mayo’s planetarium teacher Mr. Larson. Bring your friends and family along for a fun yet educational time learning about our universe. Tickets are $6 for kids and $8 for adults, so reserve your seat now by following this link: https://www.signupgenius.com/go/60b0c4aaeae2aabf49-reserve then pay upon arrival. There are 52 seats available per show. Reserve your ticket now, in advance, to ensure your seat because all shows have sold out during the past three years! 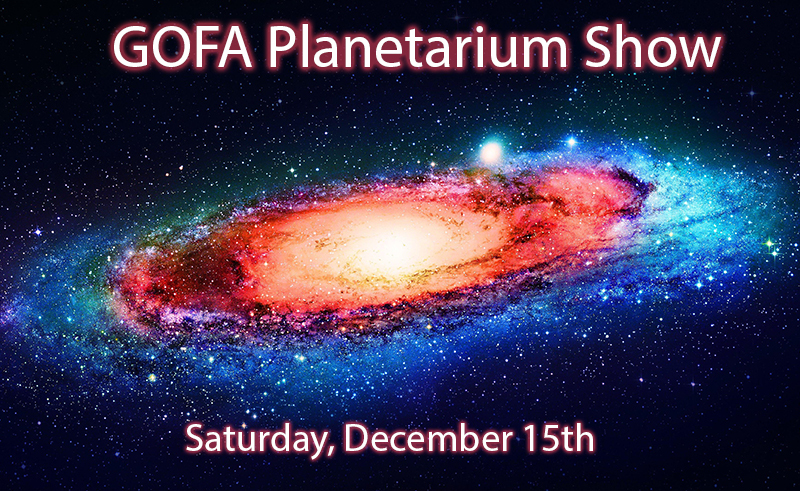 If you want to learn about our universe and night sky or just want to have an enjoyable, warm night looking up at the stars, then join us in the Mayo planetarium on December 15th to support GOFA.